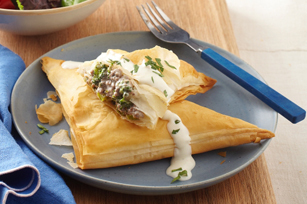 Turn ground beef and broccoli into something special with a creamy garlic sauce and crispy phyllo dough. Mix cream cheese spread, 2 Tbsp. milk and garlic until blended. Reserve 3 Tbsp. cream cheese mixture. Brown meat with onions in large skillet; drain. Return meat mixture to skillet. Add broccoli; cook and stir 3 min. Stir in flour and pepper. Add remaining cream cheese mixture and sour cream; cook and stir on low heat 2 min. or until heated through. Place 1 phyllo sheet on work surface; brush lightly with butter. Repeat with second phyllo sheet; cover with third phyllo sheet. (Do not brush top sheet with butter.). Cut phyllo stack lengthwise in half with pizza cutter. Repeat with remaining phyllo sheets to make 16 strips. Spoon 3 Tbsp. meat filling onto 1 end of 1 phyllo strip, about 1 inch from corner. Fold over opposite corner to form triangle. Continue folding, like a flag, to opposite end. Repeat with remaining phyllo strips. Place turnovers, seam sides down, on baking sheets; brush with remaining butter. Triangles can be frozen before they are baked. Simply freeze in single layer on baking sheets. Then, transfer to freezer container, placing waxed paper between layers. When ready to bake, place desired number of triangles on baking sheet, then bake in 400ºF oven 15 to 18 min. or until golden brown and heated through. This recipe was adapted from Real Women of PHILADELPHIA Contestant Kristen Shabaz.